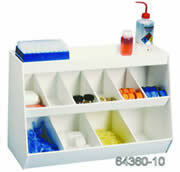 When it comes to safety, the first thing you should think of is lab organization. Everything that you need should be easily accessible at your fingertips. This will help avoid accidents, save time and money, and most importantly, keep you in good health. Furthermore, a well organized laboratory will increase your productivity and efficiency as well as the quality of your work. These organizers and workstations are made from the latest PVC, ABS, and HDPE technologies with excellent workmanship, offering easy to clean, spacious, and attractive workstations. You have two choices of wrap-around or straight line designs. 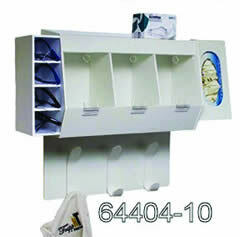 These organizers offer a protected center work area with stylist appearance. 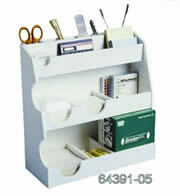 Organizer 1 – Straight line style measures: 24" (L) x 8.25" (W) x 12" (H). 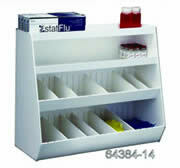 This model available with optional clear acrylic hinged doors help protect your supplies. 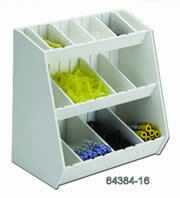 Organizer 2 – Straight line style measures: 30" (L) x 10" (W) x 15.75" (H). 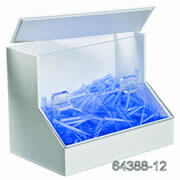 This model available with optional clear acrylic hinged doors help protect your supplies. These Balance-Serves offer a generous amount of storage; an ideal solution for those cluttered spaces. 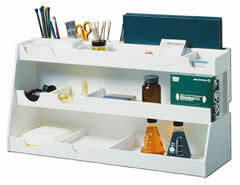 This workstation features 13 compartments and shelves for serving the needs of the weighing task. 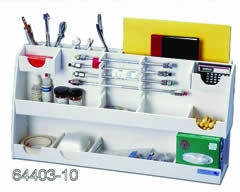 Built-in accessory holders organize pens, markers, dissecting instruments, applicators, and cotton swabs. Built-in Kimwipes dispenser. Unit measures: 33" (L) x 12" (W) x 12" (H). Top shelf depth is 2¼", middle shelf is 3¼" and bottom shelf is 4¼". The pH meter is a "common tool" in the lab, where there are usually multiple users. Spillage is common and supplies get scattered and misplaced. 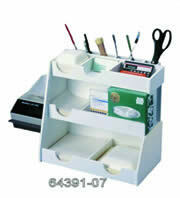 This unit makes excellent use of benchtop space and practically begs you to put supplies back where they belong. 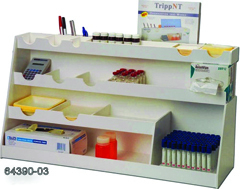 Your choice of single or double bin pipette work stations. 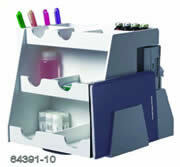 The single unit has 4 positions for pipettors, and the double bin unit has 7 positions. 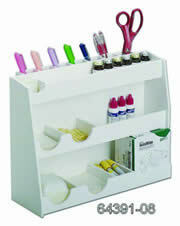 Keep your columns safe and tools at reach with this all inclusive organizer. Our GC columns make it easy to store and protect expensive, delicate glass and capillary GC columns. Designed for convenient and personal safety while one is entering or leaving the laboratory. Acrylic doors keep dust and dirt away from supplies. Room for safety glasses, gloves, lab coat, and disposable clothing, etc. 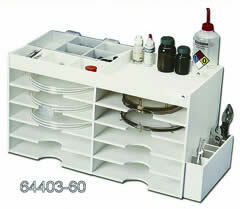 This all-in one turntable organizer offers a neat and tidy appearance for daily use at your reach in the lab. Made from PVC. 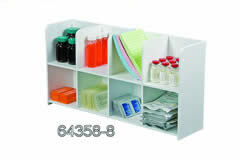 This organizer also works well in side cabinet. This organizer comes with three shelves. Shelves are progressively wider from top to the bottom, making it easy to retrieve stored items with ease. Made from white ABS high impact plastic. Bins are made from ¼" thick PVC. They are chemical resistant and easy to clean. 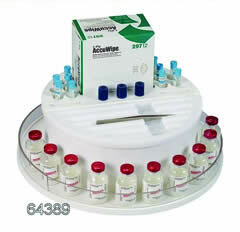 Ideal for pipette tips, small vials, cassette lids, cassette base molds, cotton swabs, aluminum stubs, embedding capsules etc. Organize all your personal items with these covered bins. 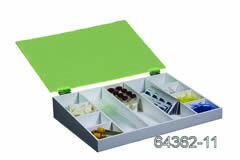 Ideal for storing pipettes, stoppers, razor blades, scalpel blades, small tools etc. 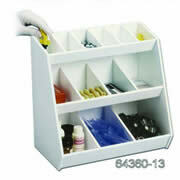 For work benches, these divided bins provide convenience access to everyday supplies. SureStand's "window" slots are the first of their kind, allowing users to store single or multi-channel pipettes easily and conveniently. 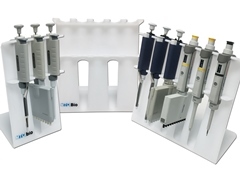 SureStand™ Pipette racks are unique in their ability to accommodate multi-channel pipettes without sacrificing any of the stability of a traditional acrylic rack. The patent pending "windows" allow the user to insert the multi-channel head longways through the rack, while keeping the body of the pipette stable by securing the pipette at two points; under the finger hook, and near the bottom of the handle. SureStand is available in 3 versions: a 3-place rack that accepts one multi-channel, a 5-place rack that accepts two multi-channels, and a 6-place rack that accepts four multichannels. Each SureStand is also outfitted with four non-skid rubber "feet" for extra stability. SureStand is guaranteed to be the sturdiest and most versatile pipette rack in your lab. 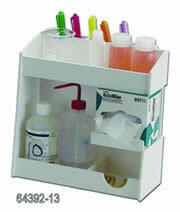 Hold and store your pipettes in style with our new universal carousel pipette stand. The sleek and modern design of this stand enables it to securely hold virtually every known brand of pipette in the marketplace, making it truly 'universal', while adding a pop of color to a bench top. Hold up to 8 single channel pipettes, 4 multi channel pipettes, or a combination of both pipettes. Pipettes are held in a vertical position to help prevent contamination. Inserts on the upper holders can be added or removed to accommodate the fit of different pipette widths. One handed removal or replacement of pipettes is easy with the rotating head and stable weighted base. Moving the stand while keeping pipettes in place is simple with a quick grip handle allowing a user to grab and go. The pipette stands come with additional upper leaves to enable multiple color coding configuration options, as well as a change in color to your work space, for a bit more fun. 64387-01 Blue/Green (8 of each) Blue (8) 6.2" W, 9", 16.1"
64387-02 Purple/Clear (8 of each) Purple (8) 6.2" W, 9", 16.1"
64387-03 Clear/Asst. (8 of each) Clear (8) 6.2" W, 9", 16.1"
Gamma (g) rays are produced when an unstable isotope such as I125 enters into nuclear decay; this form of electromagnetic radiation is attenuated by lead. The gamma rays intensity increases exponentially as the thickness of the lead increases. The recommended thickness of lead for use with 125I is 0.5mm. We use 3mm lead for all of our g protection products. Other isotopes shielded by our products include 32P, 51CR, 35S, 33P, 3H, and 14C. 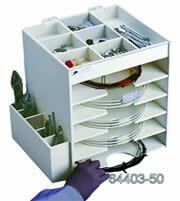 The enclosed boxes are perfect for shortterm storage of isotopes and contaminated labware. 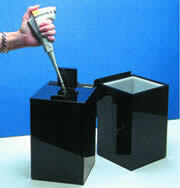 All our gamma disposal boxes feature a polyethylene liner and sleek black acrylic exterior.